Rudy Gestede scored in each half as Blackburn Rovers beat Reading to register a third successive victory. The win puts Gary Bowyer's side just four points behind current Championship leaders Watford. Gestede's header from Ben Marshall's cross gave Blackburn the lead but Glenn Murray's tap-in levelled for Reading. A superb Marshall free-kick restored Rovers' advantage and Gestede knocked in a rebound after Jordan Rhodes had nodded against the post for 3-1. Blackburn winger Ben Marshall has scored five goals this season, including three in his last four appearances for Rovers. Blackburn have hit form in recent weeks and are now unbeaten in five games, helped by a series of impressive performances from winger Marshall, who was involved in all three goals for the hosts. Murray hit the crossbar early on for Reading, who remain in mid-table, and after ex-Cardiff forward Gestede powered a header past Adam Federici, Crystal Palace loanee Murray fired an angled shot wide. A tame effort from Rhodes should have made it 2-0, and that miss proved temporarily costly as Murray converted Jordan Obita's low centre to equalise. Marshall found the bottom corner from 30 yards to put Blackburn back in front, and the game was over as a contest when his cross resulted in the home side's third. Reading have lost five of their last six away matches in all competitions and won one of their last eight league fixtures. Blackburn manager Gary Bowyer on winger Ben Marshall: "You look at the goals and Marshy's contributed to all three. We're delighted with his contribution, but I keep saying it - there's more to come from him. I thought his work-rate was terrific. "We get stronger in the second half. The fitness levels, energy and belief they've got is fantastic and it was evident again today." Reading manager Nigel Adkins on Blackburn's second goal - from a free-kick he felt should not have been awarded: "I've watched it back on video four or five times and for me it's not a free-kick, and it's a big turning point. From there, the confidence in Blackburn grew. "We've got to keep going and keep the belief about ourselves - the grit, passion and perseverance to keep doing what we believe is the right thing." Match ends, Blackburn Rovers 3, Reading 1. Second Half ends, Blackburn Rovers 3, Reading 1. 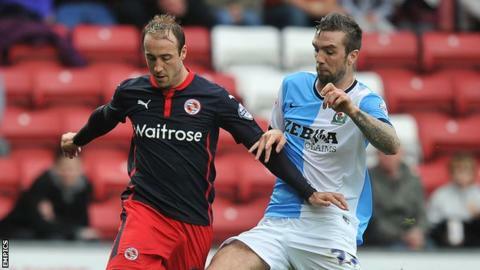 Luke Varney (Blackburn Rovers) is shown the yellow card for a bad foul. Foul by Luke Varney (Blackburn Rovers). Attempt missed. Chris Gunter (Reading) left footed shot from outside the box misses to the right. Delay in match Jake Cooper (Reading) because of an injury. Attempt missed. Nick Blackman (Reading) left footed shot from the right side of the box misses to the right. Assisted by Glenn Murray. Attempt missed. Tom Cairney (Blackburn Rovers) left footed shot from outside the box misses to the left. Assisted by Ryan Tunnicliffe. Substitution, Blackburn Rovers. Craig Conway replaces Ben Marshall. Attempt missed. Simon Cox (Reading) left footed shot from the right side of the box misses to the left. Assisted by Daniel Williams. Corner, Blackburn Rovers. Conceded by Chris Gunter. Substitution, Reading. Daniel Williams replaces Hope Akpan. Ben Marshall (Blackburn Rovers) wins a free kick on the left wing. Corry Evans (Blackburn Rovers) is shown the yellow card. Hope Akpan (Reading) wins a free kick in the attacking half. Goal! Blackburn Rovers 3, Reading 1. Rudy Gestede (Blackburn Rovers) left footed shot from the centre of the box to the bottom right corner. Jordan Rhodes (Blackburn Rovers) hits the left post with a header from the left side of the six yard box. Assisted by Ben Marshall with a cross. Attempt blocked. Tom Cairney (Blackburn Rovers) left footed shot from outside the box is blocked. Assisted by Jordan Rhodes. Attempt missed. Jordan Rhodes (Blackburn Rovers) left footed shot from outside the box is too high. Assisted by Ryan Tunnicliffe. Substitution, Reading. Simon Cox replaces Hal Robson-Kanu because of an injury. Substitution, Reading. Jamie Mackie replaces Jake Taylor.